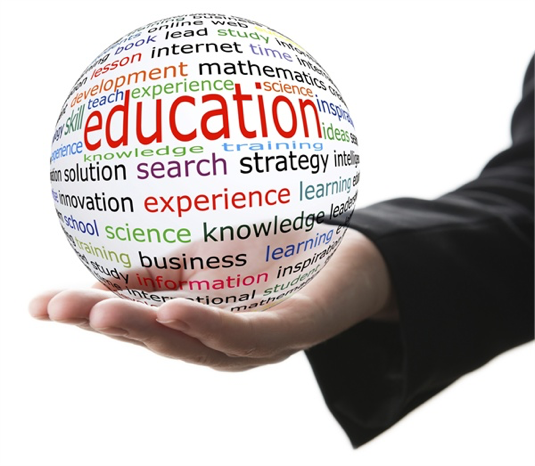 Our education, designation, and combined 30 plus years experience allows us to offer a wide range of strategies and services to help you pursue your financial goals. All financial programs that we create share two common goals; protect and grow your existing assets while helping you prepare for a confident and independent financial future. Please experience firsthand the personal attention and customized approach we take when working with our clients. Retirees are living longer, so you may need to plan for 30 or 40 years in retirement. We provide individual consultations to determine the feasibility of retirement. We will review your resources as well as your projected expenses and work with you to develop the means for a confident and independent retirement. Maximizing lifetime Social Security benefits is just one of the strategies we employ when developing your retirement plan. We also work actively with our clients during retirement to maximize their stream of income in order to provide financial independence and not outlive their income. Please click on the attached link to the social security website where you can sign up to receive your social security benefits statement www.ssa.gov. Throughout your career changes are almost certain to occur. We will help you maneuver through your employment transition by education you and your rollover options, reviewing your retirement goals in light of the changes in your employment, and discussing the consequences of your beneficiary designations. Transferring wealth from one generation to the next can be complex and time consuming. Proper estate planning is an effective approach to lowering your estate taxes and leaving a financial legacy for your family’s future. We work with your attorney to implement your estate plan from start to finish, including assistance retitling your assets to avoid probate or reduce estate taxes. We help you develop and execute the financial independence of your heirs. We can help families to effectively redirect their capital by gifting and charitable planning. 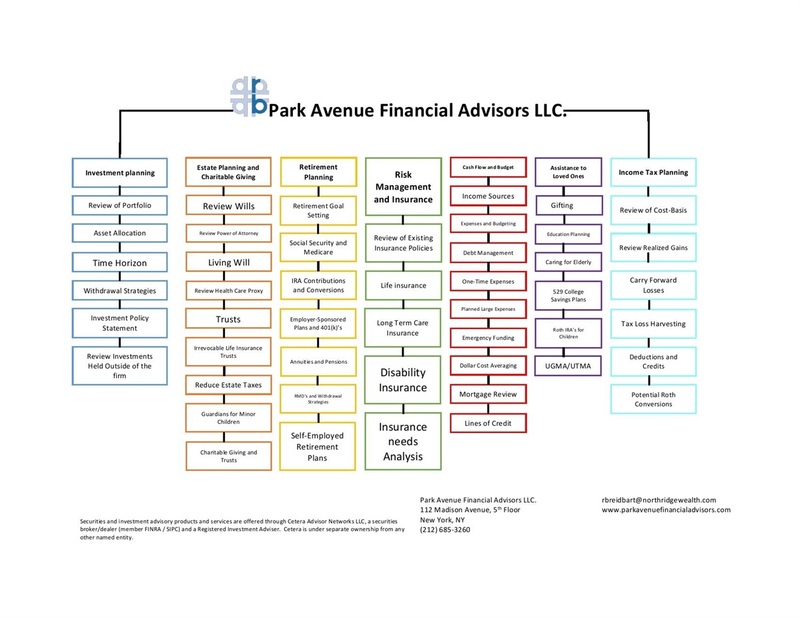 Park Avenue Financial Advisors can help you invest and allocate your assets according to your preferred investment style and risk tolerance. Our asset management strategy eliminates to need to focus on day-to-day market fluctuations and concentrates instead on the overall investment portfolio relative to your unique goals. Life insurance needs depend on various factors and that are unique to your personal circumstances. Whether it is used to replace income, cover debt, protect assets from taxes, or provide additional opportunities to create wealth, life Insurance is a critical part of any financial plan and must be reviewed regularly. You work hard and save money your entire life to ensure you have enough funds to secure your retirement, as well as pass on assets to your heirs. If you were to have a long-term care need, your savings could be depleted very quickly without a proper long-term care policy in place. Most people will need assistance with activities of daily living at some point in their lives, whether due to aging, injury, illness or disability. Long Term Care can be Skilled Nursing Care, Custodial Care or Respite Services. Keep in mind that Medicare is not nursing home insurance and that Medicare supplement plans do not cover daily maintenance care. Long Term Care Insurance helps manage healthcare costs and reduces the impact of inflation, while ensuring that your healthcare needs, and those of loved ones, are covered well into the future. An investment in higher education is an investment in the future. Planning for college is most efficient and effective when done early. We help you to develop strategies to help make the most of your savings and reduce the amount you and your loved ones may need to borrow to pay for school.